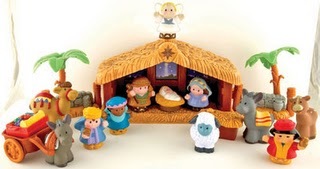 Fisher Price Little People Nativity Set. This is selling for $49 on Amazon right now. But, Family Christian Stores has it on sale for $29.97. Use code 123023301 to take an extra 25% off. Total cost ends up being only $22.48! Shipping will cost $2.99. But any order over $40 will get free shipping!